Alice Ringwald’s memory is a blank slate. Except for the past six months, she completely lost the first 13 years of her life. But everything is changing again now. She’s been whisked away from her kind foster parents by a man named Wyatt, who claims to be her stepfather. He says her name is Eden, and he is taking her to her real mother. Katherine’s future has just become bright as the sun. The daughter who was stolen from her as an infant --- her beloved Eden --- has been found, thanks to Zeke, the leader of the Louisiana swamp-based cult where Katherine lives with her husband, Wyatt. It was Zeke who told Wyatt where to find the missing girl. Eden’s return brings great joy to Katherine, not just because she loves her, but because Eden is going to make everything better. She is perfect and pure --- the bringer of great blessings. Katherine knows this to be true because that revelation came to her directly from Zeke, along with specific direction for Eden’s strict and unusual upbringing. Daily purification rituals, weekly baptisms that bring Eden to the brink of drowning, and harsh rules that change without warning are Eden’s new way of life. Her survival will depend entirely on whether or not she can become a water walker. "WATER WALKER hooks the reader from the start with a kidnapping in progress. Many fans of Ted Dekker will likely enjoy this novel." Eden plans to escape the night she’s brought to her new home…until her heart is touched by 10-year-old Bobby, the little brother she never knew existed. Certain that something isn’t right about her new family situation, Eden seeks a way for Bobby and her to leave, but discovers they are surrounded by swampland and alligator-infested waters, along with the viscous dogs that Zeke sets loose at night. At first, Eden goes along with the strange rituals while working on an escape strategy. But with each passing day, she becomes brainwashed into accepting her new life as the “right way” to honor God. She is scrubbed several times a day, not allowed to let her feet touch the ground, required to fast and spend long periods locked in a closet. Some rules are permanent, others change randomly, but all must be followed to avoid punishment. Simultaneously, she is repeatedly told that she is the perfect lamb, and Bobby, who is sweet, loving and slightly mentally challenged, is the tainted goat. Five years later, Katherine is rewarded for her obedience to Zeke by his revelation that Eden, whose biological father was a wealthy senator, stands to inherit a million dollars on her 18th birthday. This “blessing” must be given to Zeke, who will generously allot a small portion to Katherine’s family. In order to acquire the money, however, Eden must leave the swamp to sign papers at a lawyer’s office in town. It will be the first in a series of circumstances that cause Eden to dream about Outlaw, a mysterious man who helps her see her situation for what it really is, and guides her along a path of forgiveness. This newfound clarity and inner strength will result in a peace Eden has never experienced, and the miracles that come with a true connection to the Savior. WATER WALKER hooks the reader from the start with a kidnapping in progress. 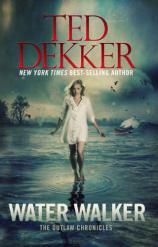 Many fans of Ted Dekker will likely enjoy this novel. For me, however, there were too many reasons to keep it off my “must read” list. He introduces a special agent who isn’t mentioned again until the end of the book. There are seemingly random chapter switches between first and third person, and the dialogue was less than captivating, particularly the dream conversations between Eden and Outlaw. Decker has devised an interesting plot, though, with good character development and imagery.